Strength Training Program for Men "My experience at Shape Plus has literally transformed my life" - Jeremy W.
Every man needs strength and should gain confidence when he looks in the mirror. Whether you are putting on a suit and tie, tank top and flip flops, or a swimsuit you should feel proud of your appearance. Others definitely notice your appearance, and just as noticeably, your confidence and self-assuredness. That confidence is admired by both sexes, male and female, and is persuasive from the boardroom to the bedroom. LEAN MUSCLE IS WHAT PEOPLE SEE, RESPECT AND DESIRE. An effective men’s strength training program will build lean muscle, increasing your metabolism and causing your body to use more calories for repair rather than storing those calories as fat. More lean muscle will make you leaner. The extra calories you take in will repair your growing muscles and fuel your workouts. If you have not been strength training properly, it is likely that your strength will double in your first two months with a Shape Plus trainer. If you adhere to the program we create for you, and with you, then you may have amazing results like this. Strength training is most commonly thought of as only for looks (not that there is anything wrong with that) and vanity, but that’s not its only application. Functional Strength – Shoveling snow, carrying groceries in one trip, mowing the lawn, putting the kids in and out of the car and carrying them for endless miles, moving furniture, defending yourself and/or others if a circumstance arises. Increased strength of muscles, tendons and connective tissues – You will have a decreased risk of injury in sports, everyday life and work. You will have more fun in one way or another in all of them. Increased performance ability –Increased performance in sports, your job, vacation excursions, playing with kids, playing with your spouse i.e. – G-Rated or X-Rated here. Contributes to fat free body mass – Lean muscle increases your metabolism and it demands calories that would be stored for fat. Increased bone density – Your bones are as strong as the amount of resistance that you place on them. Looking amazing and feeling amazing – Makes your life more fun and you live it with confidence. ▪ Bodybuilding – Progressive resistance exercise with longer periods of rest between sets to maximize strength gains. ▪ Circuit training – Resistance training aerobically to increase strength and muscular endurance. Circuit training targets muscle and endurance and can burn a ton of calories. It has a long lasting effect of turning on your calorie burn rate (EPOC) excess post-exercise oxygen consumption for up to 72 hours after your workout so you get great lean muscle and you also dramatically increase fat loss. At Shape Plus, we start by finding out exactly what your strength levels are and then we will scale your workouts, exercises and weights according to your current strength. Then we will increase the demands on your muscles with more weight as your become stronger. This will increase your strength and muscle size. For your specific fitness goals as outlined in your MMAP® a combination or hybrid program of bodybuilding and/or circuit training will be favored over the other with or without cardio and include a perfect nutritional program to get you strong, lean and mean. 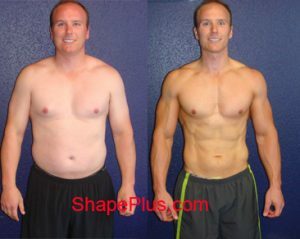 Contact Shape Plus today to speak with a trainer regarding our men’s strength training programs! Contact us for more information about our Strength Training Program For Men!